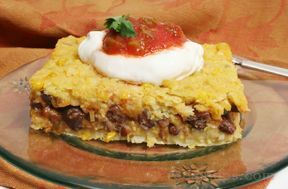 Here's a way to get that great tamale taste in an easy casserole version. Chop onion, garlic and pepper(s). Heat oil and cook onion, garlic and pepper until softened-- about 5 minutes. Mix meat with 3/4 teaspoon salt, crumble and add to pan. Cook and stir until meat is done. Add tomatoes, corn, broth and chile powder. Simmer together while preparing the corn meal. Bring 2 cups water to a boil; slowly add corn meal, stirring vigorously to prevent lumping. (Mixture will be quite thick.) Add 1/2 teaspoon salt, or to taste. Stir corn meal mixture into other ingredients. 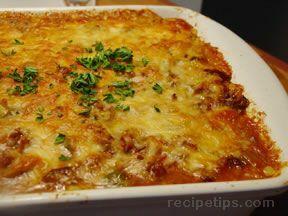 Sprinkle cheese over the top and bake about 30 minutes. TIP: if you use an oven-proof skillet to prepare ingredients, bake the pie in it and save cleaning up an extra dish.